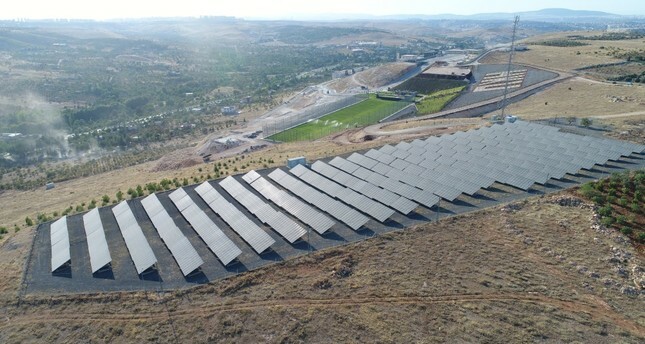 Solar panels on the campus of Hasan Kalyoncu University in Gaziantep. More institutions have turned to renewable energy as greenhouse gas emissions increase in Turkey. Turkey was one of the first countries to join the global fight against climate change but figures released by the Turkish Statistical Institute (TurkStat) Thursday still paint a gloomy picture when it comes to greenhouse gas emissions. Data by the state-run agency says overall greenhouse gas emissions such as carbon dioxide equivalent for the year 2017 were 523.6 million tons and the energy sector accounted for the largest share of emissions at 72.2 percent. Total emissions increased by 140.1 percent in 2017 compared to 1990, the year Turkey started tracking emissions. In the face of rising emissions, Turkey strives to diversify its energy resources and increase investments in renewable, nonpolluting energy. TurkStat figures show that the biggest share, with 86.3 percent of total carbon dioxide emissions, was the energy sector while 34 percent of total carbon dioxide emissions stemmed from electricity and heat production. Turkey, which was once one of the biggest polluters in the world in terms of greenhouse gas emissions, is gradually cleaning up its act by focusing on renewable energy and turning its back on coal power. Renewable energy plants are more integrated with the country's electricity sources. A recent report by the International Renewable Energy Agency (IRENA) shows that scaling up renewable energy, combined with electrification, could deliver more than three-quarters of energy-related emission reductions needed to meet global climate goals. The country aims to invest roughly $11 billion in energy efficiency over the next five years, cut its primary energy consumption by 14 percent, and reduce 66 million tons of carbon dioxide emissions, Turkey's Deputy Minister for Energy and Natural Resources Alparslan Bayraktar said on Tuesday. Speaking at an event in Berlin, Bayrak said Turkey's wind and solar installed capacity increased to 15.2 percent of total capacity in recent years and for one day in April, the country managed to supply 63 percent of electricity supply from only renewables. TurkStat figures released Thursday show carbon dioxide equivalent emissions per capita were 6.6 tons in 2017, while it was 4 tons for the year 1990. Figures also show that the remaining 13.4 percent of emissions, apart from the energy sector, originated from industrial processes and product use and 0.3 percent of them came from agricultural activities and the waste sector in 2017. In addition, agricultural activities significantly contributed to methane emissions which contributed to 62.3 percent of those activities. Agricultural activities also had the biggest share in total nitrous oxide emissions at 71 percent. Increasing energy consumption in the country with dynamic population growth makes Turkey one of the highest in the world in terms of energy demand growth. A growing economy is another major drive in demand. Currently, the country relies on hydroelectricity, especially in rural areas, and is still heavily dependent on energy imports for domestic demand. The Turkish Parliament ratified the Kyoto Protocol against climate change in 2009. Under the protocol, the country has the responsibility to organize the gas emission inventory and the computation of emission reduction. The government encourages investors to take up renewable energy projects and provides incentives, especially for energy-efficient products. Turkey is ahead of developed countries in terms of greenhouse emissions cuts, according to the National Inventory of Greenhouse Gas Emissions. Forests helped the country see reductions in greenhouse gases, especially in the past four years.